After returning from Blæsedalen we had a couple of days of cloudy damp weather so we used the time to explore the local area and recover from mosquito bites, waiting for the weather to improve. A grey day, but we did manage to spot a whale so it turned out rather well! 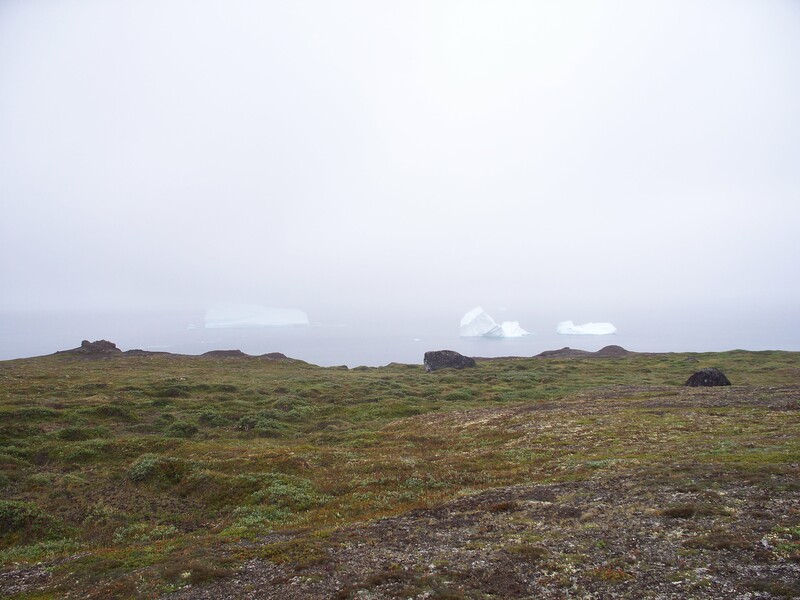 Through the fog and mist we managed to spot a Fin whale in the Disko Bay near the Arktisk Station. Fin whale, the second largest whale species, are an endangered species, so it was an amazing sight. Mark could not resist picking up a lump of iceberg! We walked along the black basalt beach which is so dark as the upper layers of rocks on Dikso Island are primarily volcanic. 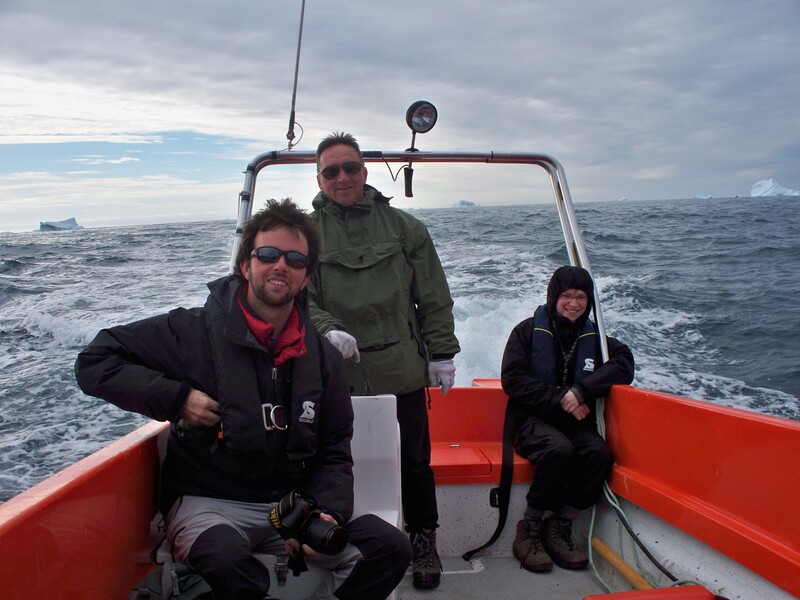 Mark could not resist picking up a lump of iceberg! This ice will have likely been deposited as snow possibly hundreds, or even thousands of years on the Greenland ice sheet. 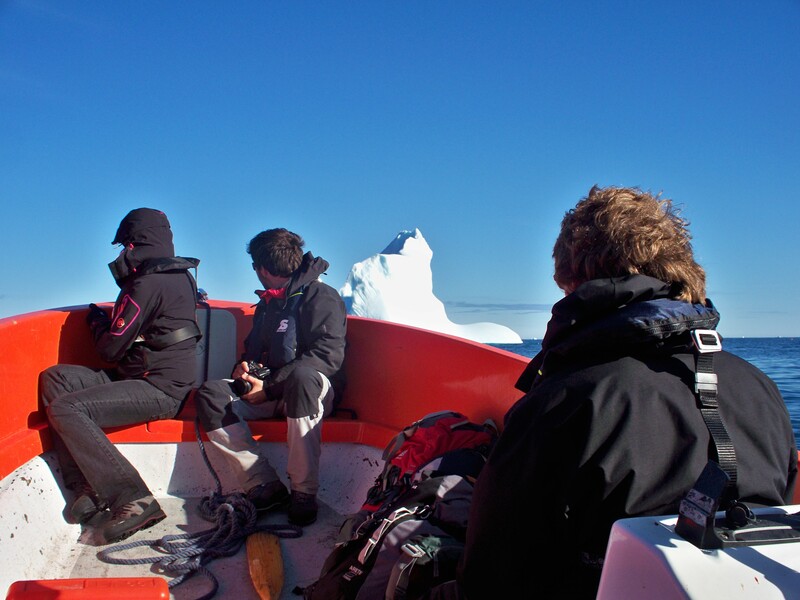 It most probably entered the sea in the Ilulissat Ice fjord 100km to the East of Disko Bay. Arktisk Stations research vessel Porsild within the Qeqertarsuaq harbour. 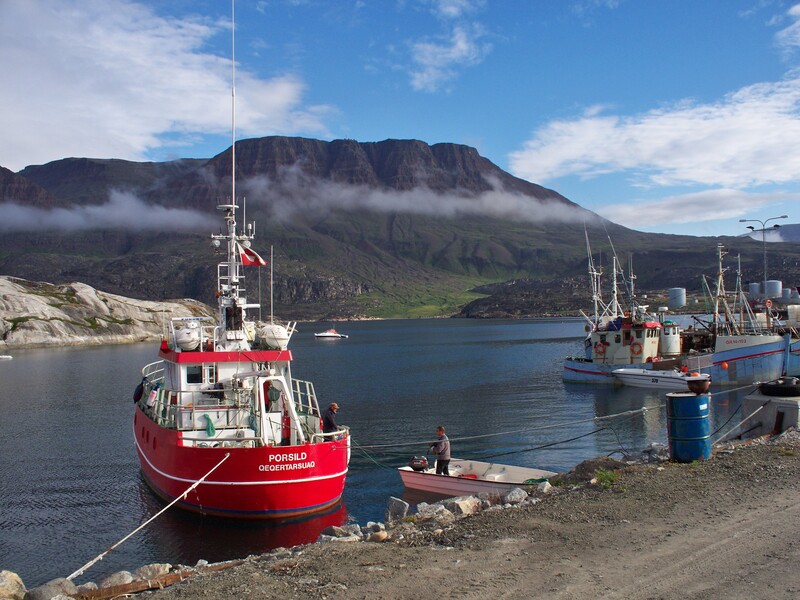 Image of the stations research vessel Porsild in the Qeqertarsuaq harbour. 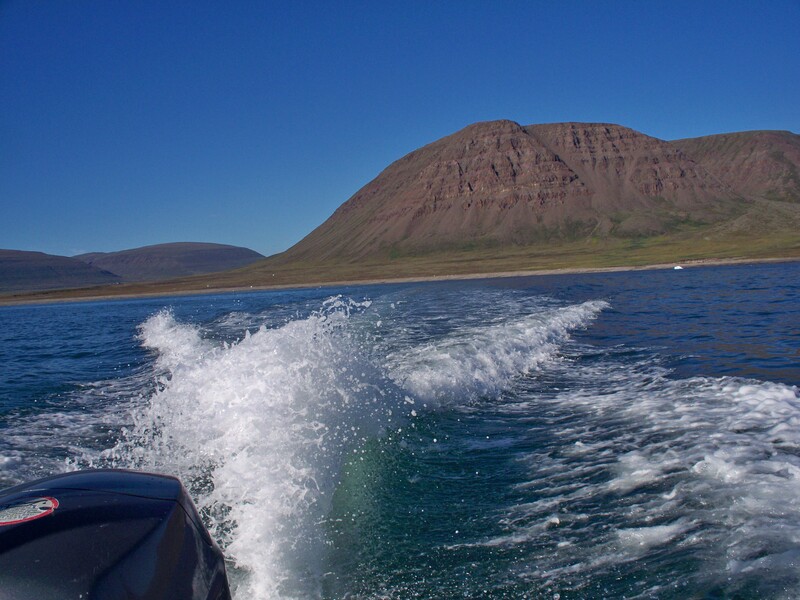 The weather cleared up on Wednesday and the rough sea became much calmer so with the station logistics leader Akaaraq we went by speed boat west around the coast to the bay Laksebugt. 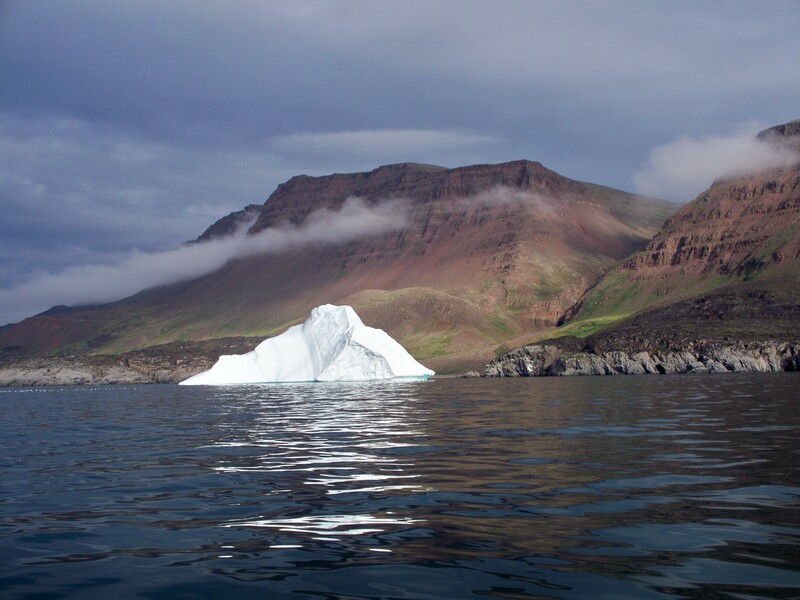 An iceberg beached by the coast in contrast to the dark blue sea and the basaltic cliffs. The journey was very exciting and fast with such a powerful speedboat. 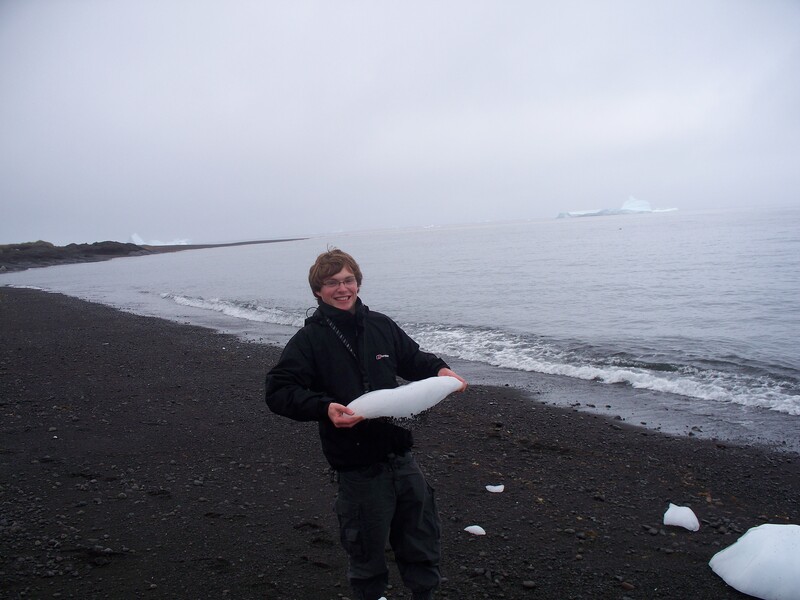 We saw many ice burgs and were joined by Tim from Durham University and Kathryn who is based at Queen Mary in the University of London. When I was here in April Tim and Kathryn were also visiting Artksik station so it is amazing that they have chosen to return at the same time. 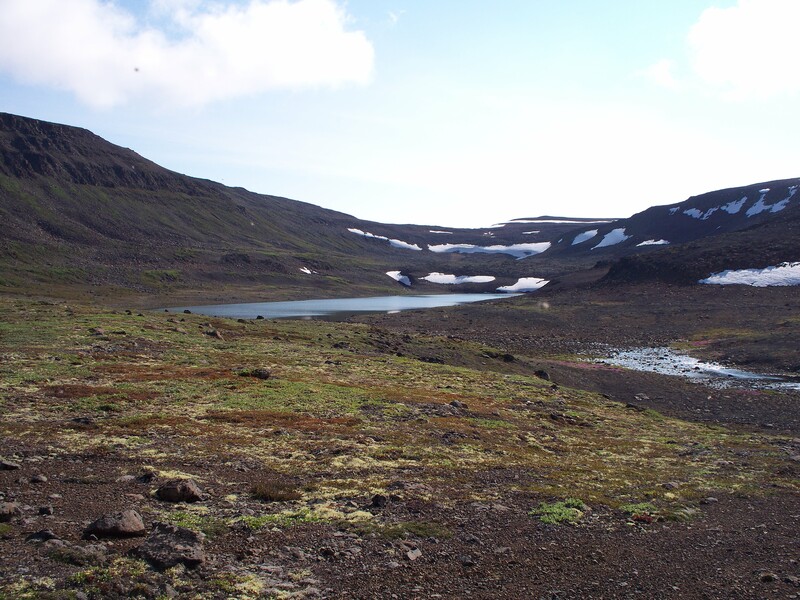 Tim and Kathryn are researching the seasonal variations in Glacial Geomorphology here on Disko Island. You can find out more about their work here. Arrival at Disko 4 as the cloud begins to evaporate. 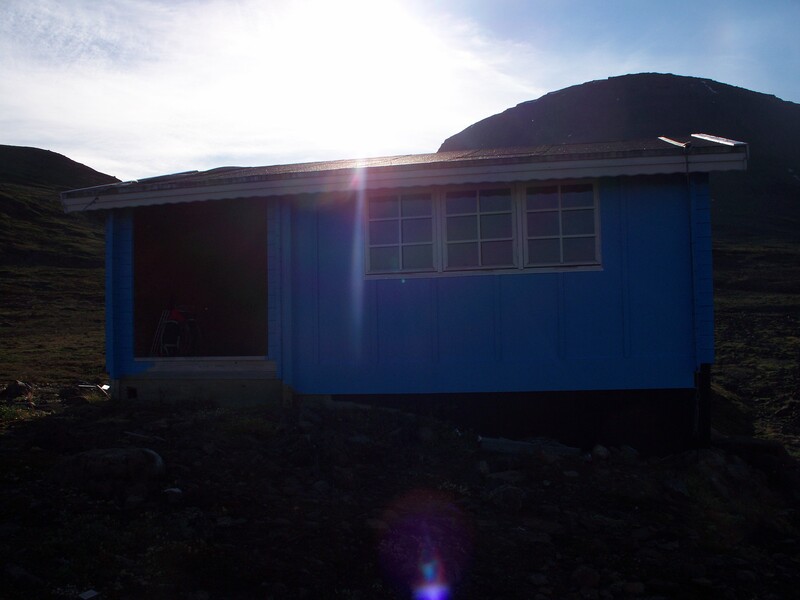 A panoramic shot of Disko 4 after the sun came out a short time after starting the fieldwork. We reached Laksebugt after about 45 minutes on the boat and promptly set off for the lake, which is at about 350m above sea level through quite boggy terrain. It was well worth the hike though, because, despite the persistent mosquitos, the lake was beautiful and we were lucky enough to have blue skies for much of the day. The fieldwork went well and all samples were collected without incident over the course of around 5 hours before we began the hike by down to the beach. The views on the decent were fantastic (see below). A spectacular view of Lakesebugt (salmon) Bay on the way back down to the beach. 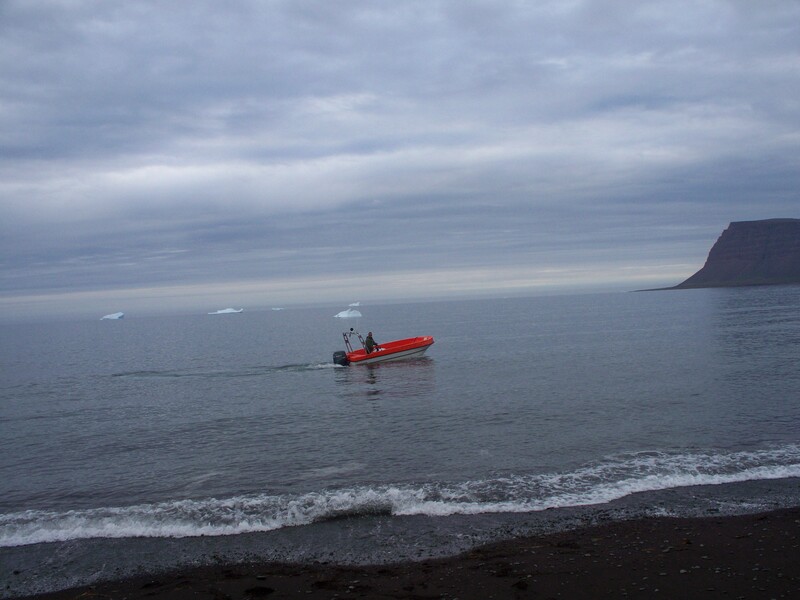 The return journey home with the spray from the speedboat as we launched our way back to Qeqertarsuaq harbour. Admiring the view on the journey home. 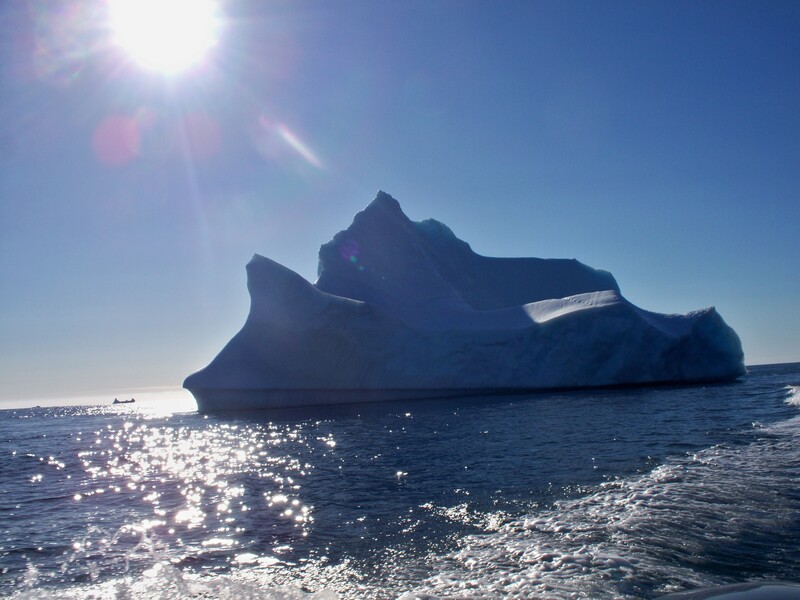 Icebergs glisten in the sun on the way back to Arctic Station. 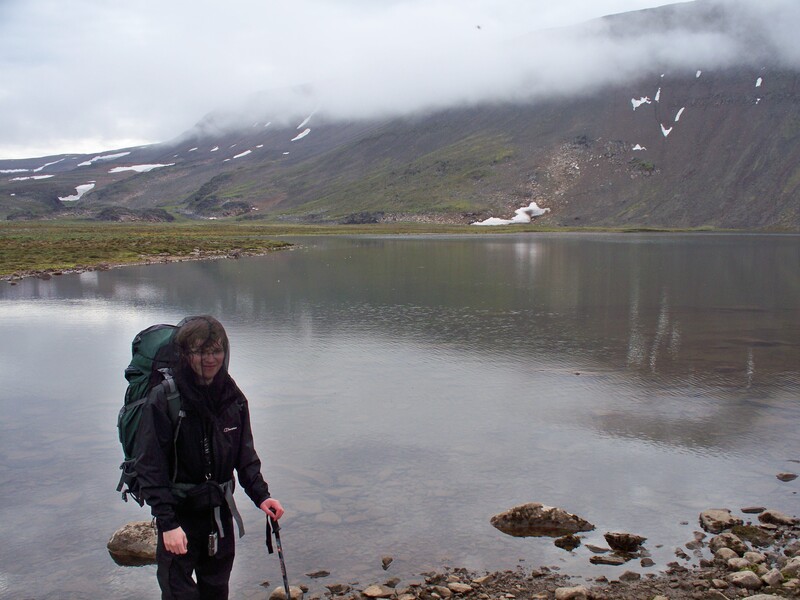 We have returned from four days of fieldwork visiting two lakes in the Blæsedalen valley (in Greenlandic, Itinneq Kangilleq) here on Dikso Island. 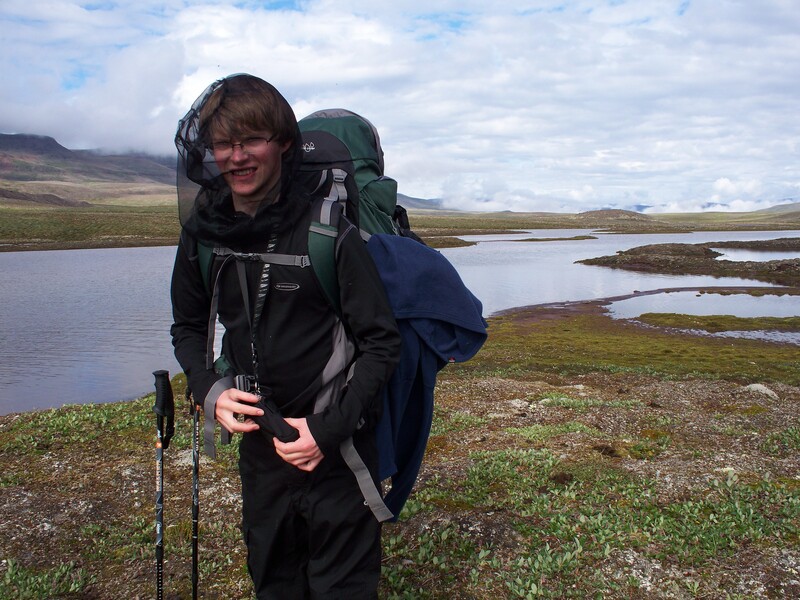 The hiking was very tough as the terrain is very hummocky, requiring passage through boulders, cobbles, bog, moss and shrubs while carrying our provisions and field equipment. To get to our base camp near the first lake took about 9 hours of hiking, but the continuous 24 hour light here in the Arctic meant there was no rush for dusk. Image of the Blæsedalen valley on the first day. Low cloud covered the valley, but visibility was sufficient although the peaks of the valley walls could not be seen. The first lake, named Disko 1 for the purposes of this project became visible as the clouds evaporated on the second day. 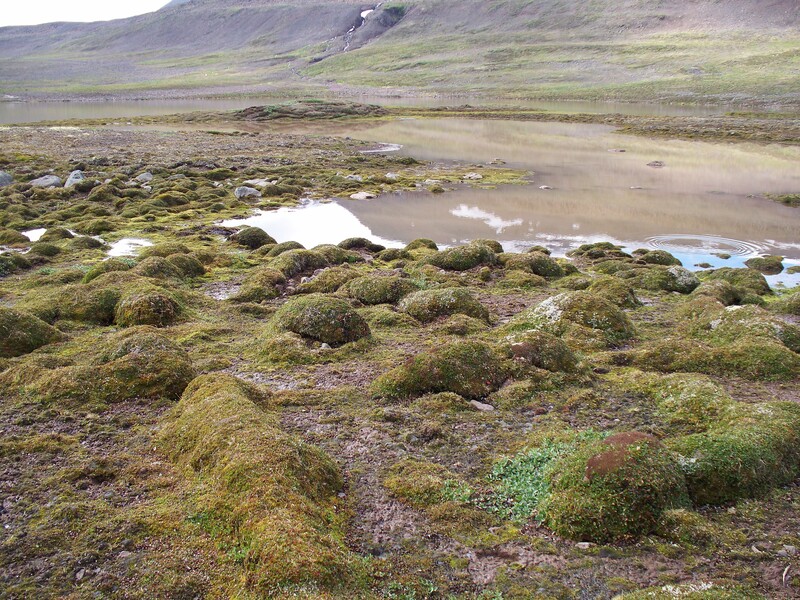 The lake is approximately 1km wide and is surrounded by a mossy, guano rich bog. Disko 1 lies in the central part of the Blæsedalen valley at an altitude of approximately 388 meters. 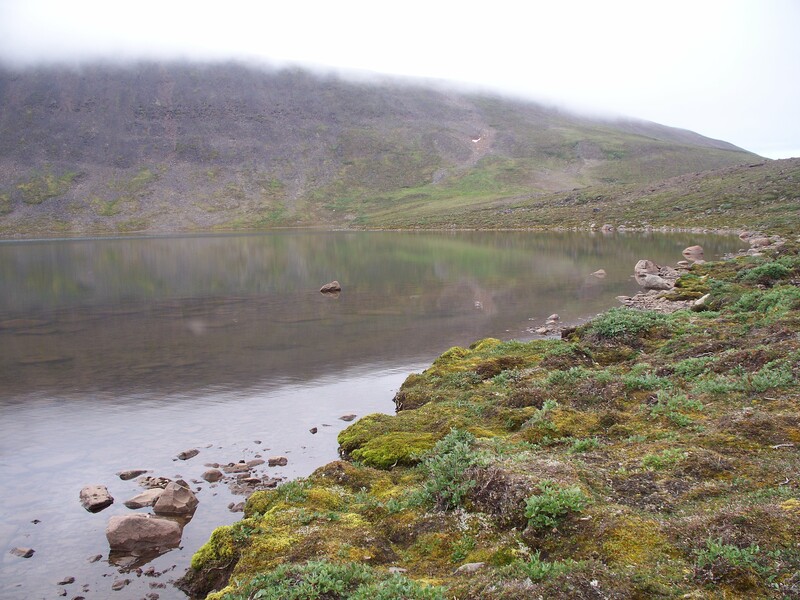 An example of the terrain and small ponds surrounding lake Disko 1. An attack by mosquitoes at lake Disko 1. Despite covering myself in Jungle Formula DEET, ‘Mosiguard’ and homemade citronella extract repellent I still got no fewer than 15 bites. Joe was not on the mosquitoes menu and only got a couple of bites! 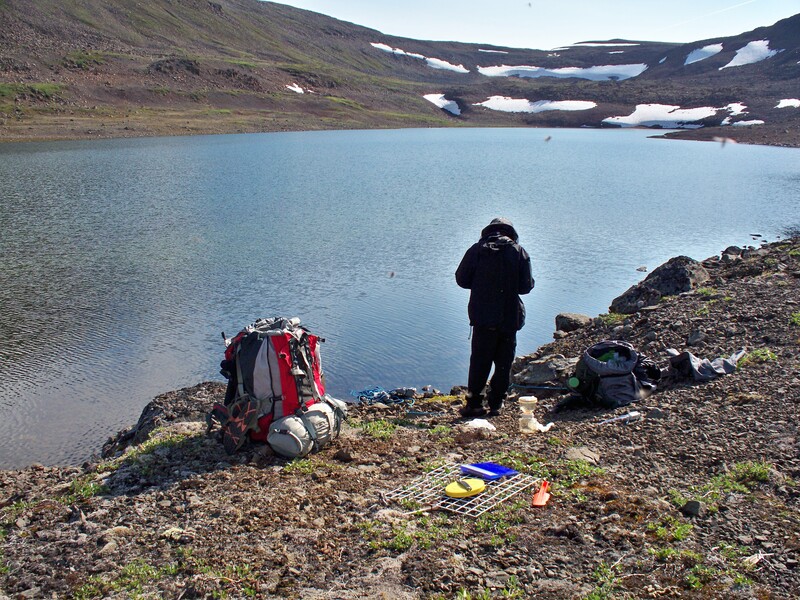 Water sampling at lake Disko 1. We took lake water samples for nutrient analysis back in the lab and filtered lake water for lipid and pigment source studies. 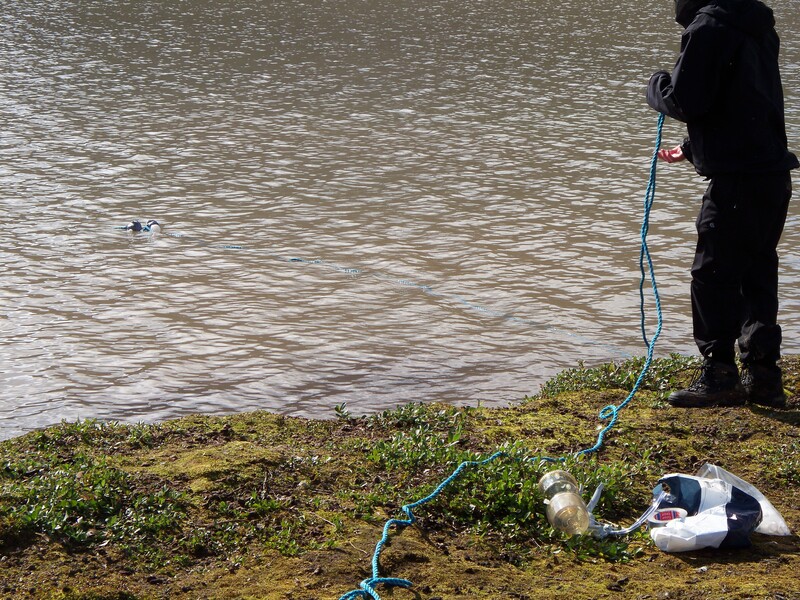 We also measured dissolved oxygen, temperature, conductivity and pH using a YSI probe that was calibrated in the field. On the third day we hiked for about three hours to lake Disko 2 which lies in a glacially scoured basin with steep head walls at either side. 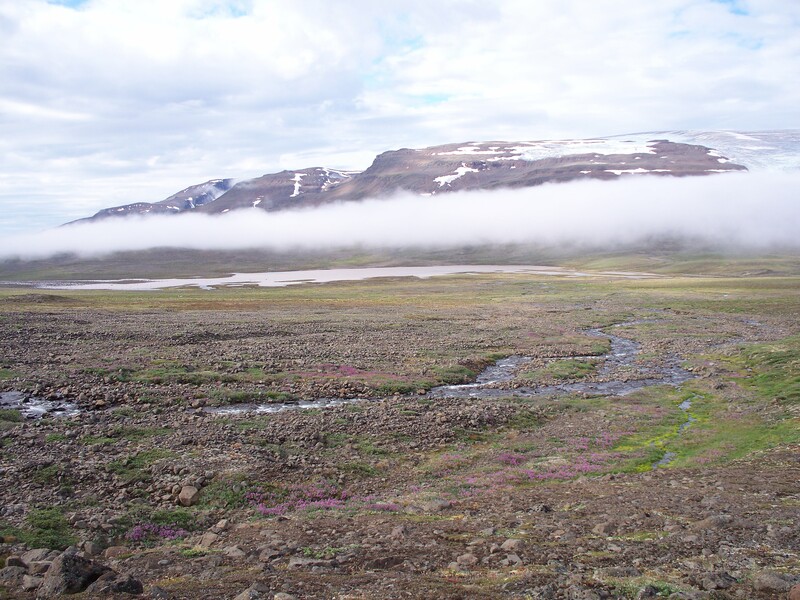 Here, at an altitude of 630 meters the vegetation is sparse and the soil is poorly developed in many places. Freeze-thawing is a key action responsible for weathering the basaltic cliffs and is responsible for mounds boulders surrounding the lake. After the limnology was completed we took soil and plant samples from the surrounding catchment and estimated plant coverage using quadrats at sites in a transect from the lake basin. 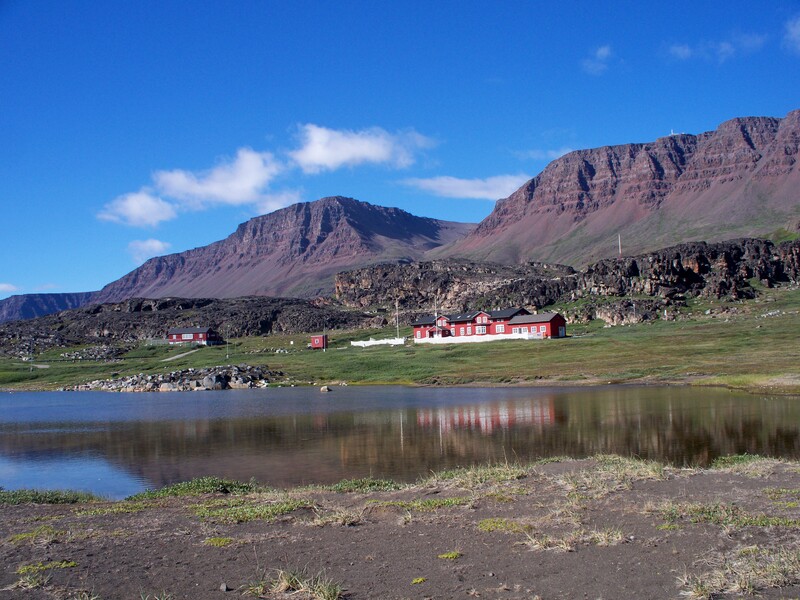 We decided due to the terrain that it was better to return to our base near Disko 1 to spend the night. The hut where we stayed for three nights, located in the Blæsedalen valley about 45 mins walk from lake Disko 1. The view of the Blæsedalen valley as we embarked on the hike back to Arktisk Station. Arktisk Station comes into view as we return after four days fieldwork. We are now rested after a day to catch up on sleep and have eaten lots of Greenlandic produce to boost our energy levels. 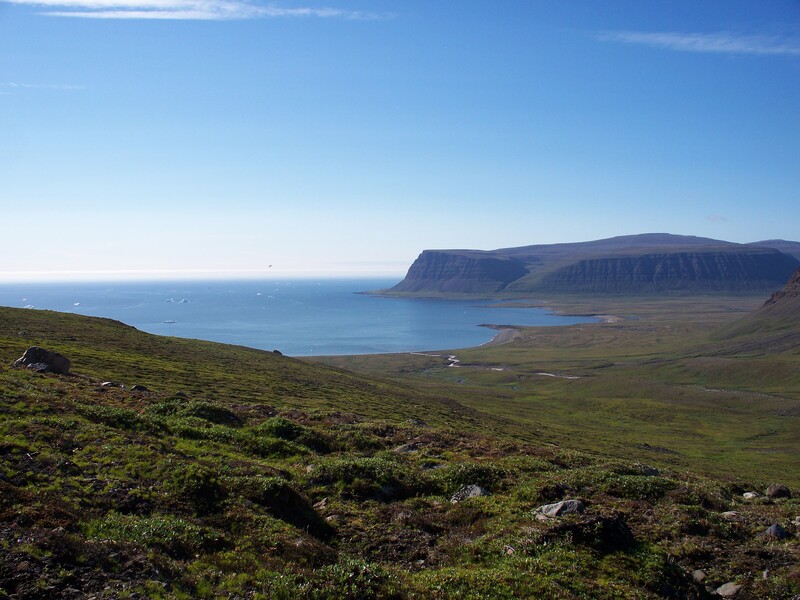 Tomorrow we will take a motor boat sailed by Akaaraq in a westerly direction around the coast from Qeqertarsuaq to a beach at Laksebugt (Itilleq) from where we will hike across Iparaatsi to lake Disko 4 and repeat our water sampling and vegetation surveys.